The Saturday night struggles continued for the No. 5 Quinnipiac men’s ice hockey team as its Senior Night was spoiled by No. 13 Clarkson, as it fell by a score of 5-3 on Saturday night in Hamden. Despite the loss, senior defensemen Chase Priskie, Brandon Fortunato and Luke Shiplo and senior forwards Craig Martin and Scott Davidson were honored before the game. Priskie scored two goals and junior forward Alex Whelan added the other. Junior goaltender Andrew Shortridge made 28 saves in the effort. The opening 20 minutes featured a few chances for both sides. Quinnipiac (23-7-2 overall, 12-6-2 ECAC Hockey) could not capitalize on a 5 on 3, then Clarkson (21-10-1 overall, 12-7-1 ECAC Hockey) was inches away from tallying its first goal on the power play, but Shortridge slid across the crease and flashed the pad on Clarkson’s sophomore defenseman Connor McCarthy. With 3:26 left in the first period, after a offensive zone faceoff win by Quinnipiac freshman forward William Fallstrom, Whelan deflected a slap shot by freshman defenseman Peter DiLiberatore past Kielly to break the tie. It was Whelan’s 10th goal on the year, making him the fourth Bobcat to reach double digits in goals. A lot more action occurred in the second as Clarkson came right out of the gates and put in two goals in the first three minutes. Clarkson freshman forward Anthony Callin picked off a Whelan pass in the Quinnipiac zone and collected his own rebound from his shot and put it home. A minute later, a one-timer by Clarkson freshman defenseman Michael Underwood just barely got past the goal line and Clarkson took a 2-1 lead. However, not long after, Priskie went end to end dangling through the Clarkson defense and Kielly to knot the game up at two. Clarkson answered with two more to take a 4-2 lead into the final frame. Freshman forward Chris Klack found himself wide open in front from the one-timer for Clarkson’s third goal. Then 25 second left in the period, junior forward Haralds Egle walked in all alone on Shortridge, faked a slapper and slid the rubber five-hole to extend the lead to two. Clarkson continued to stay hot in the third as a minute in half in, Callin fired one bar down over the right shoulder of Shortridge to make it a three goal game. But Quinnipiac would not go down so easily. Priskie fired his second of the night off of a slap shot from the point that beat Kielly glove side to bring the Bobcats back to within two. But that’s all Quinnipiac would muster as the the comeback fell short and Clarkson took the victory 5-3. Priskie became the all-time leading goal scorer among all Quinnipiac defensemen with his second goal, after previously breaking the Division I record. The record adds to his Hobey Baker worthy season. 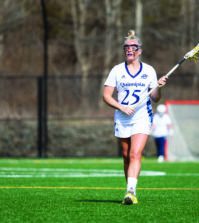 Quinnipiac’s struggles on Saturdays continued, as the team is 6-6-2 in the second game of a back-to-back and 1-4-1 at home on Saturdays this season. Quinnipiac’s final regular season weekend will begin in Providence, Rhode Island on Friday, March 1 against Brown, and then it’ll finish the season in New Haven against its rivals Yale on Saturday, March 2.